33 page views. That was a watershed moment for me. I blogged about my family pictures (you can go to the post here) from the beach Christmas before last. In 24 hours I had 33 people look at the pictures. Wow. I was really proud of that number. Up to that point I was averaging about 18-20 page views per day. This week I crossed the 75,000 page-view mark. Thanks for sticking with me or for finding my blog and joining in. I know in blog land 75K is nothing, and I mean hardly a blip on the great blogosphere radar. It is just an ordinary week for Remodleaholic, Shanty 2 Chic, or Roadkill Rescue, but it is a big deal to me. I do not get paid to blog. I do not have advertisements on my blog. I do not get free stuff to try out and talk about on the site. I am not opposed to getting paid, and any company that wants me to try out their stuff if free to send it my way, but blogging is not my job. 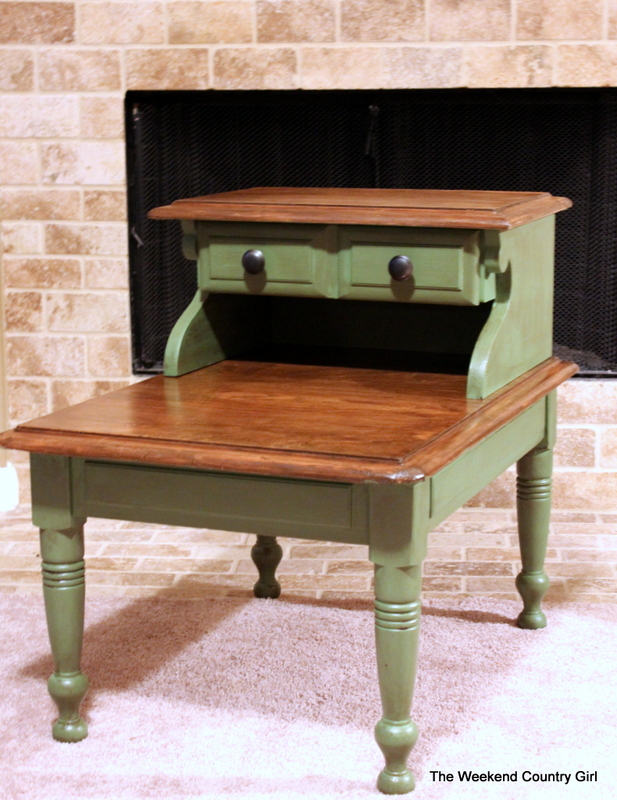 I blog, and repurpose furniture because it brings me joy. I especially like trying new things out to see if it works. I started blogging so that I could show you guys what we were up to at our weekend home, Star Hill. We were setting up a home on a shoestring budget and I got hooked looking for things to fill the home with up there that were functional, creative, and fun to have around. Along the way I have met new friends. I love hearing from you in Canada, and Spain, and other parts of the U.S. I am thrilled when I can show off a project I have done to my friends who do not live near me. I have a full time job that I love and I get paid well to do but I am thrilled to have a hobby that fills my need to be creative. A year ago I got a Facebook page for the blog. It is a fun place to talk about what I am doing in small snippets. I do try to check in there daily. If you are one of the 381 folks who like my Facebook page, thanks for checking in on me from time to time. I enjoy what you have to say and I value your input. 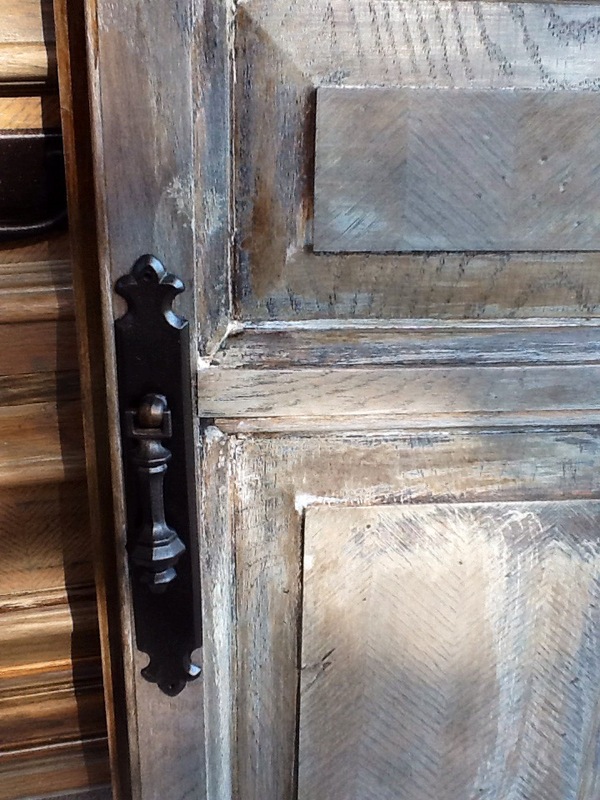 ( Because of Facebook I am now trying to replicate a zinc finish on furniture.) I am also working on posting to Instagram more often as I see things that I think might interest you. It is my goal to continue to improve as I go along. Twitter still vexes me. I seem to have two Twitter accounts set up, but this is the main one, here. It depends which device I use where it goes. Sorry. Still learning. 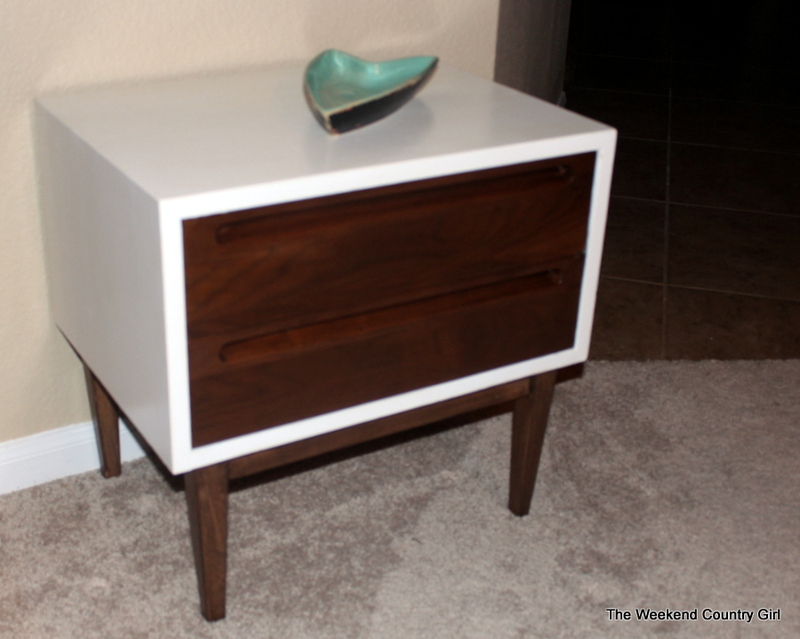 I am redoing a whole mid-century bedroom set. This night stand, a headboard and a dresser. 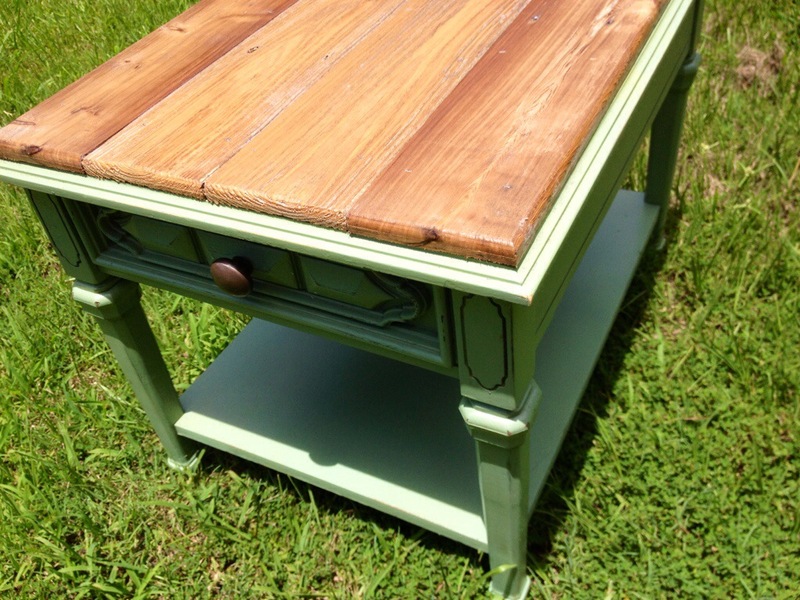 I have a thing for green mixed with stained wood. Others must, too. I have sold more green and red than any other color. This was my first ever set that someone requested I look for to purchase. Scary! I sold these two pieces to someone who put them in the same bedroom as night stands. If I had ever thought they would be together, I might have changed the colors. 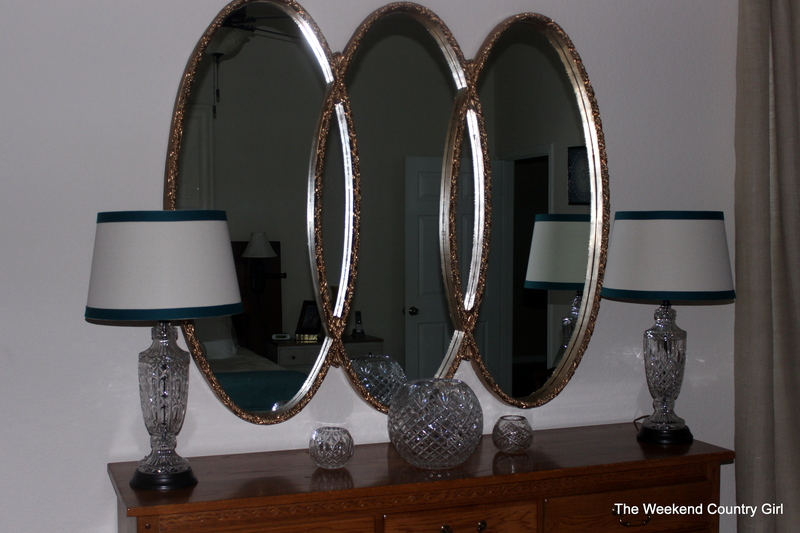 She loved them as they were and they look awesome in her eclectic guest bedroom. Red Red Wine by Behr. I know you are going to ask the color. Someone asks every time I post these beauties. 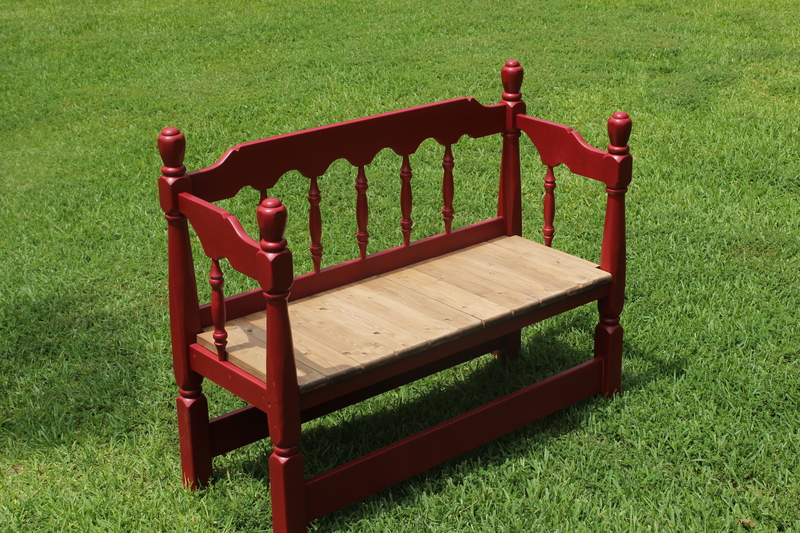 We have made four headboard/footboard beds this summer. I still have four to go. One will be finished soon. I love that they are being used by some sweet ladies and are going to be around a while. Because I have stepped up the amount of work we are doing, I have also committed to learn to use all the tools we own. I am learning to use the drill press, the table sander, and the biscuit joiner at the moment. (My first ever all on my own construction project will be coming soon. I want it to be a surprise for the recipient and they are a reader.) When I add the tools I can already use without assistance, I feel pretty accomplished. Two years ago I was terrified of a drill. Silly me. The table saw and grinder still loom large over me. They are two tools that I fear. Here is a sample of the projects I have completed in the last fewmonths. 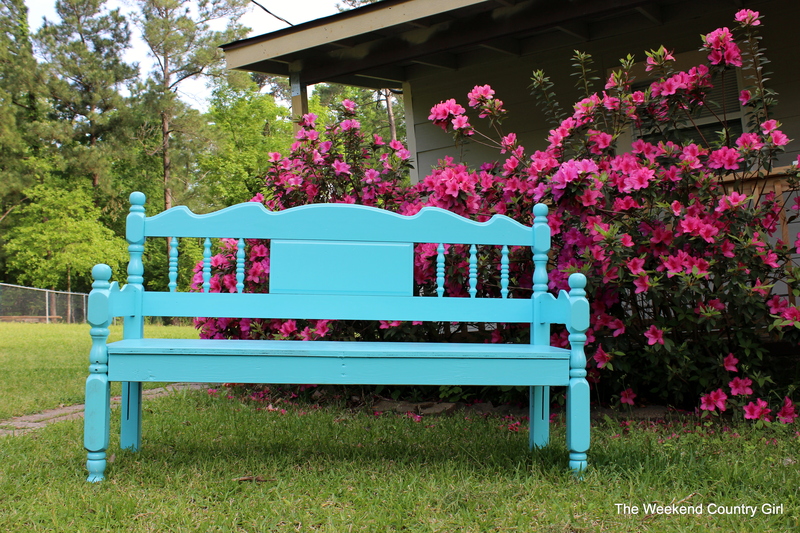 By far the most popular thing we have done is turn headboards into benches. As I said above, we have been neck deep in benches lately. 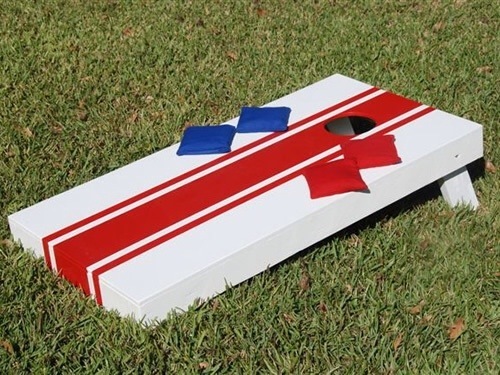 Corn Hole Game- I sewed people! 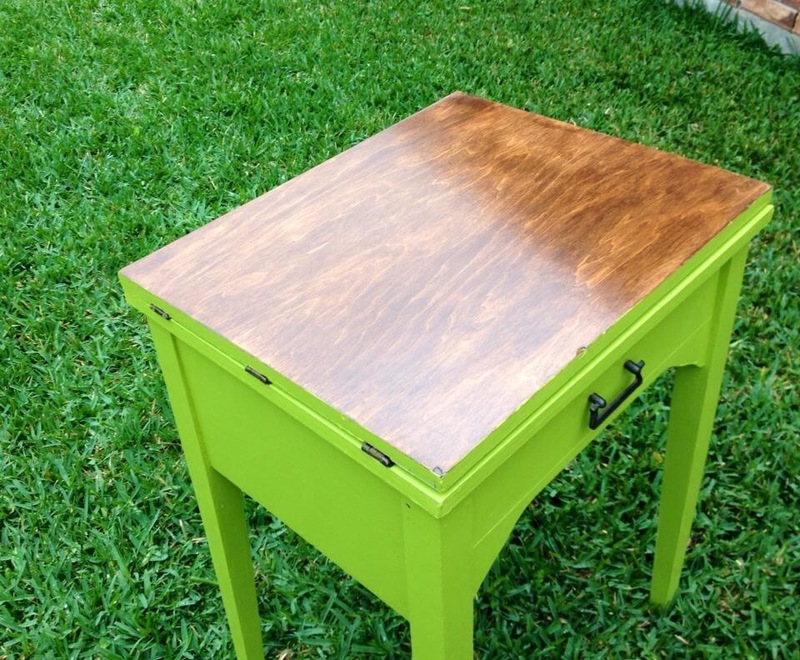 Roadside Night Stand– This was a gift for a cousin. I still love the 1970″s folks! The bathroom has been a slow project this summer. when I have to use it to get dressed for work. This $15.00 mirror makes me smile every morning. I love the look and I learned to use tinted wax on this one. 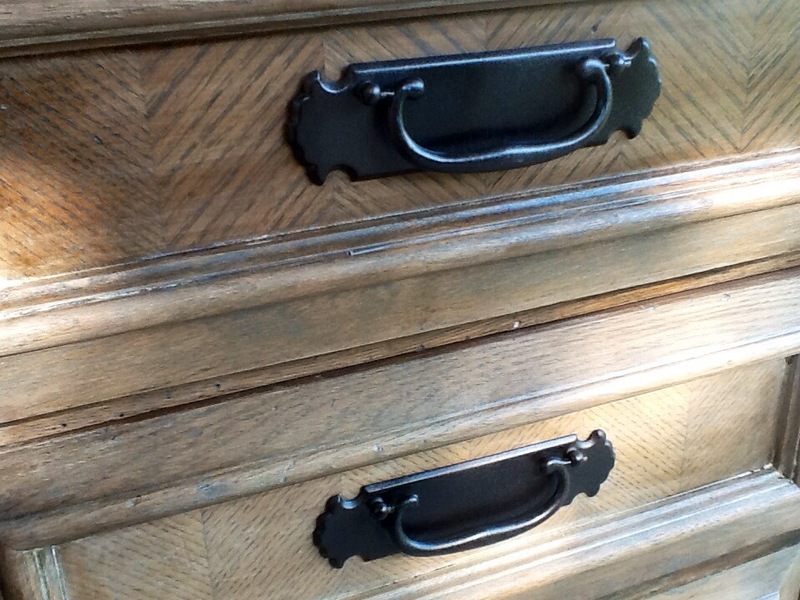 Sewing cabinet number 4. I stained the top of this one. Numbers 5, 6, and 7 are already spoken for and are hanging out in the Garagemahal. A gift for a friend who moved away. I miss her. 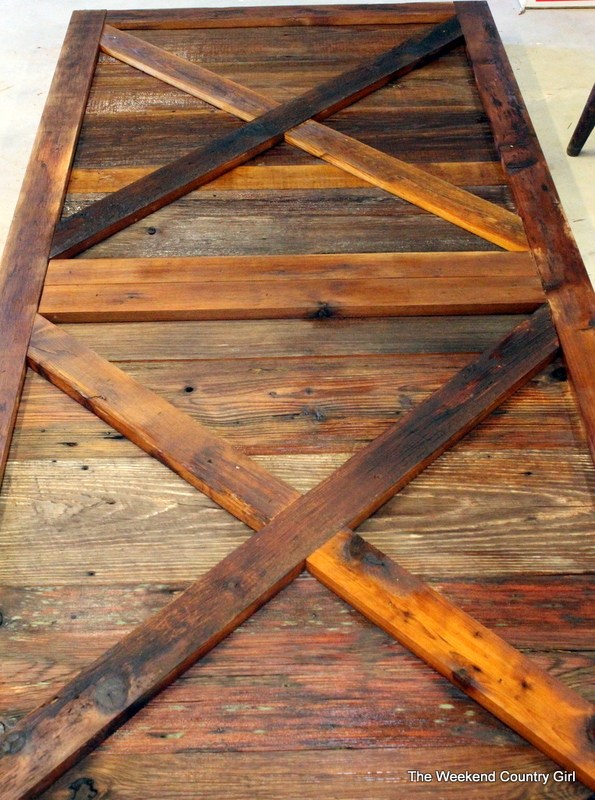 We built a giant barn door for our Burb Home out of reclaimed barn wood from my husband’s farm. I treasure this and will take it with me wherever we live. Coming up in the near future we are going to finish our master bath room. It is going from a builder basic to a rustic retreat. I am so very excited that it will be done by the end of August when Hubby returns to work. This week the electrician came to install the chandelier I made over to look like wood thanks to Life on Virginia Street’s blog. The sinks for the vanity are purchased, the faucets are waiting and the lights were picked up this week. We are moving along. During the last few months we have traveled to Costa Rica, been to our family reunion, and while you read this, we are in Durango, Colorado. I am excited to take the train ride and plan to go white water rafting. Next up on the big project list is finishing the master bedroom at Star Hill. 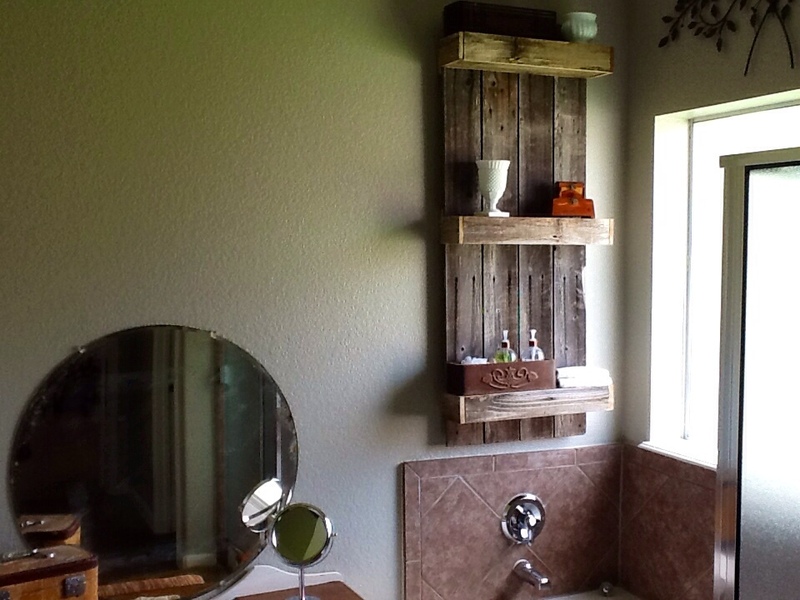 I love the reclaimed wood wall, the sewing machine night stands, and the door headboard. Still to come are curtains, wall paint, staining and painting the dressers, shelving, and décor. It will be done over two weekends, I hope. dream. It is my wish that if you do not take anything else away from my silly posts, it is that even a mid-life woman with no training and not many skills can stretch beyond her comfort zone and learn new things, attempt new projects, and chart a new direction in life. If I can do it, so can you. Thank you so very much for taking the time to read about what I do, send me messages, offer advice, and make my day sweeter. I appreciate each of you and feel very fortunate to have this opportunity to share. Congrats on the page views. 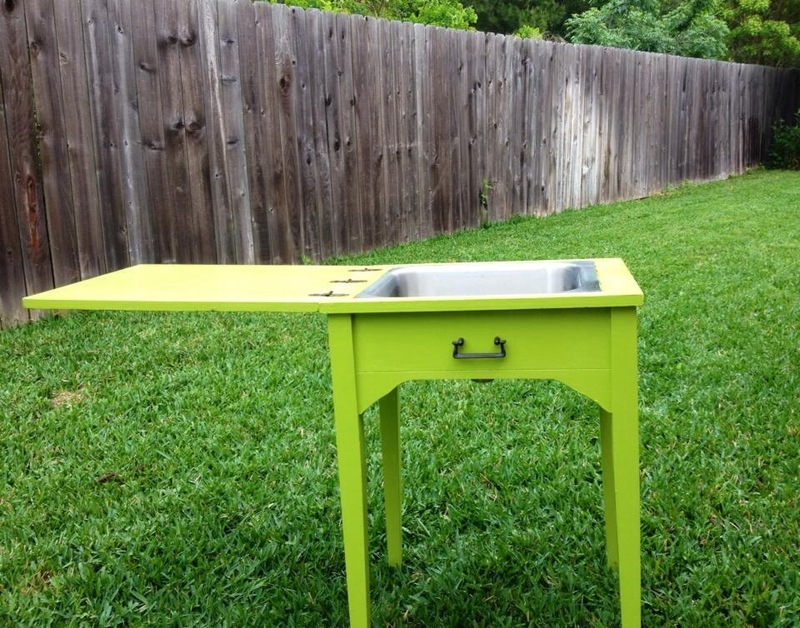 Believe it or not your blog has inspired my new found love for DIY furniture. While living in IL I did redo my kitchen and bathroom cabinets. When I saw all your projects I instantly knew this was it, my new found love! We still don’t have our own home yet (long story) so I’m at a very slow pace. Your blog has led me to a few other blogs as well. Isn’t it amazing how one persons idea can create a ripple effect to another. It’s simply awesome! Thank you so much! I am glad that I have helped you to start working on projects! What color green did you use on the nightstand, second from the top? Thanks! A Vaspar spray pain from Lowe’s. That night stand had particle board parts with a plastic sort of coating. I deglossed, primed, painted then added cedar to the top. No kidding, a spray paint from Lowes. Thank you!